It is possible that in your firm you may be using terms different from these to describe various functions. You will be able to identify the functions according to the terms used here once you have gone through the description of each function. Moreover depending on the nature of product, service or industry to which you belong you may have some functions not described here. For instance, in a bank, public relations would be an important marketing function. In a small firm, all these functions may not be individually identified and differentiated, even though they are actually performed. All the functions may be handled by just one or two individuals, who are `jack-of all trades' rather than specialists in any particular function. But as the firm grows in size, it becomes imperative to differentiate and delegate the functions to separate individuals. One man can no longer perform all the functions, and even if he can, he would not have the necessary skill or knowledge for it. All the functional specialists report to the marketing manager who has overall responsibility for marketing. Depending on the relative importance of each marketing function to the overall effectiveness of the marketing organisation, a function may either be organised separately or clubbed with another function. Further, the organisation of each marketing function within the overall marketing organisations may vary from firm to firm. Figure I depicts a typical functional marketing organisation. We shall now discuss the various options available for organising each of the marketing functions within the functional marketing organisation. Sales: The Sales function is performed by a team of sales people who are responsible for actually selling the product or service. The product may be sold directly to the actual customers and this is known as direct sales. Or else the. product may be sold to distributors, wholesalers, retailers or other middlemen, who in turn sell to the actual customers. This is known as indirect selling. A firm may sell either directly or indirectly or use a combination. We shall discuss indirect selling in the following section while here we shall confine ourselves to direct selling through company sales force. There are three basic methods in which the sales force may be organised: geographic division, product division and customer or marketing channel division. It is wise to have the sales force organised on a geographical basis when the area of sales coverage is very large and there are marked differences in the market and buyer characteristics in each area. The entire market is divided into regions or zones and each region has its own sales force. Such an organisation implies geographic division of authority and decision-making. This type of sales force organisation is very widely used and is effective when there is a single product or a range of similar products to be marketed to many geographically scattered markets. When a firm has a wide range of products, each significantly different from the other in terms of its physical and/or technical characteristics, the sales force is usually organised around each distinct product or product group. The basis for differentiating the products may be the technical process involved or the customer characteristics so that the salesman's specialised knowledge of technology or the customers can be efficiently used. Thus there is a separate sales force for each product. (See Figure II). Johnson and Johnson Ltd. in India markets a range of baby care products (soap, cream, oil, lotion) and a range of surgical sutures and meshes, the latter marketed by the Ethic division. The two product ranges are marketed by two separate divisions each having its own sales force. Another basis for organising the sales force is the different customer groups served or the marketing channel used to reach the customers. A company marketing television sets has two distinct sales teams. One team serves the distributors and wholesalers (who in turn sell to the individual customers) while the other team is engaged in selling to institutions such as hotels, schools, and universities which buy in large numbers. The company finds it useful to have this distinction because the methods and channels used for selling to these two customer groups are totally different. Many companies also find it useful to have separate sales teams to sell to the private sector and to the public sector and government bodies. A company manufacturing computer peripherals, printers, pen drives, memory chips, and consumable items such as magnetic tape has one sales team selling to original equipment manufacturers (OEM) who use these items in assembling their own branded computer, and another sales team selling to computer retail outlets such as Computer Point, Computer City, which retail these individual items on per piece basis. Many companies use a combination of above basis for organising the sales force. At the head office level, the sales team may be divided on a product basis, but if the market is very large, the team may be further sub-divided on a geographic basis. Thus, there is sales specialisation at the product level as well as the market level. Distribution: Distribution refers to the physical movement of goods from the factory to the customers. In organising the distribution function, the objective must be to find the least-cost physical distribution method which allows you to service your customers in the most efficient manner. There are three most common types of physical distribution organisations. The first is where the company has one plant and delivers to a single market. In this case the plant is usually located close to the market, the godown/warehouse is next to the plant and the cost of distribution is relatively low. Examples of this kind can be found in case of perishable foods and confectionaries, such as bread.. The company may use its own sales force or distributors who in turn use wholesalers and retailers to reach the actual customers or a combination of both distributors and own sales forces. In the second type, there are many geographically far flung markets which are served from one plant. The manufacturer can choose to ship directly to customers in each market, appoint regional or town level distributors, set up own godowns and branches in each important centre or use a combination of any of these. The third case is where there are multiple plants catering to multiple markets. The two problems in this situation are (i) those of minimising the transportation and the stock carrying costs at the current level of facilities and (ii) the long-term problem of deciding whether the combination of existing godowns and distribution centres is the most cost-effective one. At your end, you have to take decisions regarding the number and location of godowns, type of transportation to be used, strength and role of sales force. The decision regarding sales force has to be taken in relation to the type of intermediaries available. There are wholesalers, stockists, distributors, commission and freight (C & F) agents, who can act as middlemen for moving your product from your godown to the final customer. The combination of intermediaries varies from company to company, and may also vary within the same company, for each product and each market. Advertising and Promotion: There are many objectives for which advertising may be used. Some objectives are long-term and their scope is wide enough to include the entire operations of the firm. Other objectives are short-term and have a limited scope and coverage. Most firms divide their advertising budget into two parts; one part (and often the larger part) is reserved to be used by the head office for achieving long-term or corporate objectives. This part of the budget is used for advertising in national media such as television and magazines such as India Today. Some of the corporate objectives may be building corporate image, creating brand image at the national level, capturing a specified share of the national market. Thus, a large part of the advertising is planned, controlled and executed by the corporate office. The branch offices may be given a certain budget and authority which they can use for advertising in local newspapers, local radio, local hoar-dings etc. The branch offices may also have freedom to undertake some local level sales promotion such as providing signboards to selected retail outlets, and holding display contests. This is the most commonly observed pattern of organising the advertising .Function, but there can be many variations. Marketing Research: In many companies, marketing research is organised along the same lines as advertising. The major chunk of research activity is centralised at the corporate office and the branch offices have the freedom to undertake only some local level research. In a country like ours, where most market research organisations are located in the major metropolitan cities, allowing the branch offices located in small towns to initiate local research is rather irrelevant simply because there exist no reputed research organisations in these towns. Thus for all practical purposes, the entire marketing research function is usually organised at the corporate office. Marketing Information System (MIS): MIS refers to the system of collecting, processing and using information which helps improve the quality of decision-making in the area of marketing. The basic processes are collecting, processing, maintaining and using information. There are three ways in which MIS can be organised. In the first method, the role of the branch office is restricted to collecting and passing on the required information, which is then processed and maintained at the corporate office. The relevant information, reports and analyses are passed on to the individual branch offices and the rest are maintained in a master file for future use. In the second method, the branch office not only collects but also processes the information which it has collected. After processing, all the relevant and critical reports are passed on to the corporate office. However, all information files and records, collectively known as the data base are maintained at the head office. In the third method, all the three tasks of collecting, processing and maintaining information, are decentralised at the branch level. The head office receives regular reports and can requisition any additional information that it requires. The use of computers and introduction of real time information systems and networking has greatly increased the efficiency of MIS, irrespective of the manner in which it (MIS) is organised. Customer and Dealer Relations: This is rather a broad-term and may include activities such as after sales service, and development of new customers, markets, and dealers. The specific activities included under this head would vary according to the nature of product and type of distribution channel which the firm has. In terms of organising this function, it is usually decentralised since efficient servicing of the relationship requires proximity to the customer and dealer. But the manner of servicing the customer/dealer may be strictly defined by company policies, guidelines and procedures. New Product Development: This is probably the most critical function for a company which wants to be in business five, ten and fifteen years from today, and yet it is often the most neglected function. The reason for this is that most companies are organised for today and not for the future. New product development requires vision and foresight and the ability to take risks. It requires an organisation in which new product development is recognised and organised as a separate activity and allocated resources but the expectation of results is not specified. It is not enough to merely create a .research and development cell. At the most it may produce some technical improvements or modifications in the product. But unless there is a marketing person involved with the R & D, you cannot expect a new product which would satisfy customer wants. Ideally the organisation for new product development must include marketing people who have thorough knowledge of market and buyer characteristics. 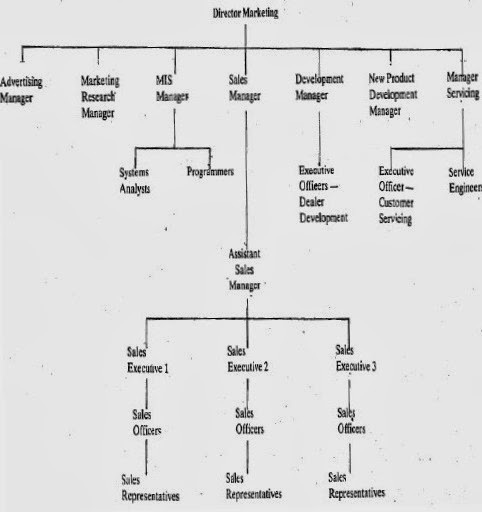 One way of organising for new product development is to totally segregate the organisation for existing and new products as shown in Figure III. Richardson Hindustan Limited (engaged in manufacturing and marketing the Vicks range of products and Clearasil cream and soap) is organised on the basis of product teams. Of the total of 20 product teams, only 8 work on the existing products, while the remaining 12 work on new products. Marketing Planning: This includes activities such as forecasting, target setting, budgeting, establishing control and review procedures, and strategy formulation. Sales targets are usually set on the basis of market knowledge of the sales staff combined with the top management's vision for the future. Each area salesman provides feedback on the potential in his area and the competitor's strength. All this data are compiled into a area-wise target plan which is discussed across the table between the marketing people and the top management. Budgeting and establishing control and review systems have traditionally been the exclusive preserves of top management. The budget for the coming year is based upon last year's budget with a certain percentage increase to account for inflation and genuine increase in expenditures. The middle and lower levels of management have not much to contribute in this kind of budgeting exercise, But the introduction of zero-based budgeting has changed this. In zero-based budget there is no historical precedent to base the budget upon. Each expenditure head has to be justified afresh for inclusion in the budget, since the last year's expenditure on this head is assumed to be zero. The entire onus is on the operating managers for preparing and justifying expenditure heads. In strategy formulation, top management requires the active participation of the marketing people in term of their feedback on success of present strategy, competitors activities, and consumer tastes. Thus, the functional marketing organisation is based on the different sub-functions performed as part of the overall marketing function. 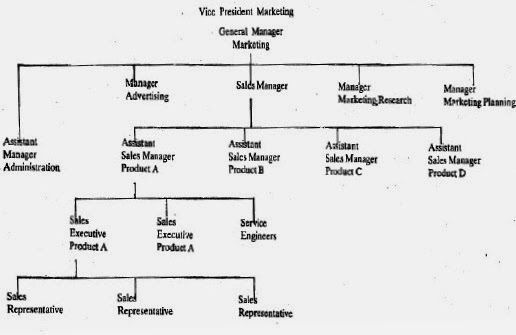 The manner in which each sub-function is organised varies from one company to another, depending on the unique combination of internal company attributes and external environmental factors.